Hello! It's time for a new Mojo Monday sketch (#199).. Thanks to everyone who played along last week.. your creations were all wonderful! I hope you will join us this week! Accessories: Standard Circle and Inverted Circle Nestabilities, Floral Doily Accent (Spellbinders); Wrinkled ribbon (May Arts), Resin flower (Webster's Pages), Paper flower (Kaisercraft), Foam tape, Thread, Sewing machine. Lovely, Stephanie - I have that paper on its way to me - thanks for the inspiration! Very cute card Stephanie! 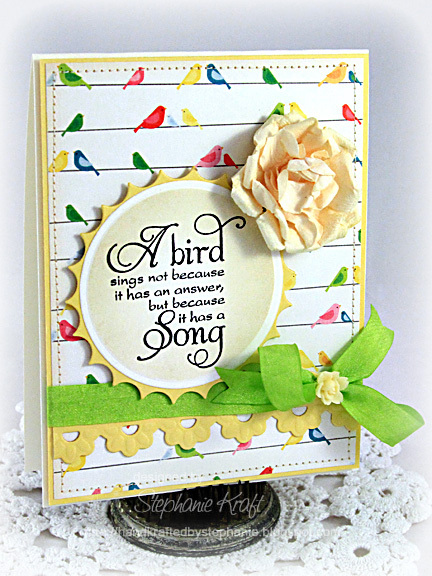 Love the beautiful sentiment and the darling patterned paper full of little song birds! Thanks for the inspiration! GORGEOUS card and such a beautiful sentiment! Love the colors Stephanie!!! Beatufitul card, love the flower and the pairing of the sentiment with the bird patterned paper. This is just fabulous, Steph! I'm currently fascinated with birds on a wire, so I'm going to have to go get me some of this paper! Beautiful card. Another perfect combination of design, papers, and sentiment! Perfectly designed! Hi dear. Wow Verve sure has many beautiful sentiments. Love how you created the card around it. What a happy card and what agreat reminder. Love all the details. You sure have a talent!